Am I Losing Money When Option Value Increases After Entering A Covered Call Position? The risk in covered call writing is in the stock purchased not in the option sold. Sound familiar? It’s in all my books and DVD Programs and mentioned in my seminars and webinars. Yet it appears when we look at our brokerage statements that this concept is not true. That is because we see a minus sign after having sold the option and the number adjacent to that minus sign gets larger and larger if the value of the option increases. That leads some investors to believe that if option value increases, there are terrible losses about to be realized…not true. 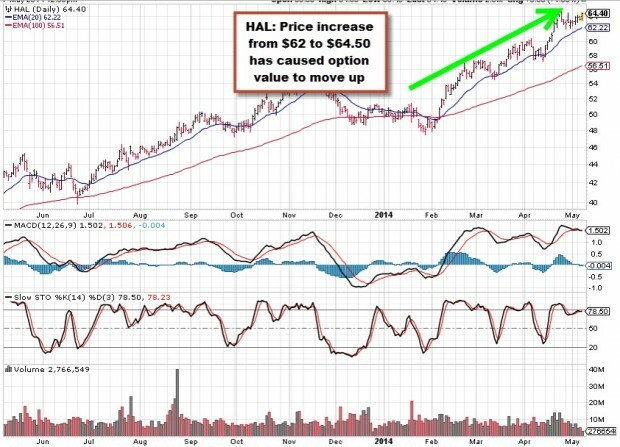 As the price of HAL rises to $64.38, the option value moves above $2…are we now losing $75 per contract? We have learned from studying the Greeks that an option value will change by its delta for every $1 increase or decrease in share value. We also know that as a strike moves deeper in-the-money (as this option is doing) the delta moves higher or closer to “1” In this case, the option is nearly $2 in-the-money, so the intrinsic value alone is close to $2. 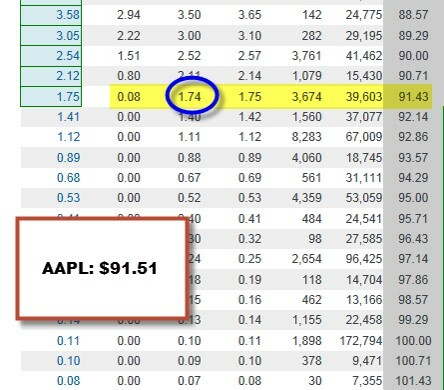 In this case, theta (time value erosion) is having a lesser impact on option value than is delta. Are we now losing money on the option side? NO we are not. The minus sign or (Brackets) displayed in our broker statements are there for accounting reasons and mean that we have an “open” position which in order to close would leave us in a net debit position (a loss). However, the choice to close the position is totally ours to make and will not be executed unless it is in our best interest. For example, we may close the short position if rolling the option on or near expiration Friday will result in a net credit that meets our goal. Another example where we may close our short position at a higher price than entered is when we execute the mid-contract unwind exit strategy (pages 264 – 271 of the Complete Encyclopedia…). These two scenarios are favorable trades that generate additional cash flow in our portfolios. Finally, we can take no action at all. If the price of the stock is above the strike and it doesn’t make financial sense to close the short position, we allow assignment which means that we have maxed our trade. We received the initial option premium plus any share appreciation from purchase price to the strike and our shares are sold for the price we agreed to sell them for when the trade was initiated. The cash is then used to establish a new covered call position the following week. Once the position is closed, the negative (brackets) signs will disappear in our broker statements and our option gains will be realized. Rising option value is a positive for us despite the negative appearance on our brokerage statements. Our main concern is when share value declines and in that case so will option value. Link to register will be uploaded to this site once received from The Money Show. For the week, the S&P 500 rose by 1.4%, for a year-to-date return of 7.2%, including dividends. The premium site is temporarily down due to server issues with the hosting company (Friday evening). We hope to resolve this matter soon and apologize for this inconvenience. The Weekly Report has been competed and will be uploaded as soon as the website comes back online. I am back in Asia and downloading my weekly update in Hong Kong before taking the ferry back to China. I had a good first month ‘all in’ with the BCI method. Began with $40,000 and ended with $41,671.82. All 5 remaining stocks were assigned and a fresh start this week. The Exit Strategies are the key. I did 7 mid-contract unwinds. (yes I am a little impatient), four were profitable and three I let get too far away. 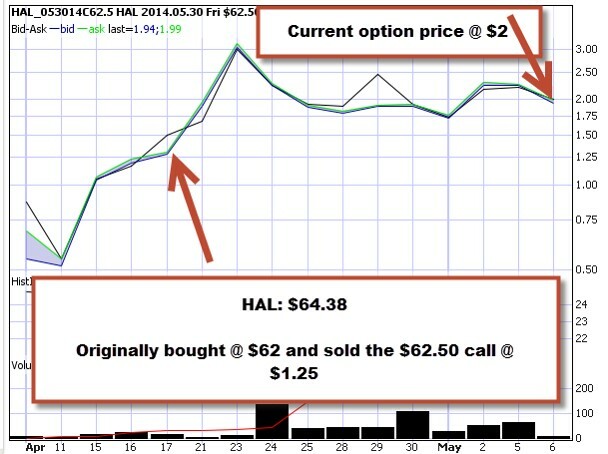 In a uptrend market, and after buying the underlying stock, do you immediately sell the option? The reason I ask is because it seems to make sense to by the underlying stock on a down day and wait a day or two for the price to rebound and then sell the option. Any thoughts on this. Thanks Alan, over 4% month one. I’m glad to learn of your recent success and especially that you are taking advantage of our exit strategy opportunities. I find that it is quite challenging to predict market movement day-to-day and so if the returns meet your monthly goals at any given point in time, enter the entire position at that time rather than waiting for share appreciation and then selling the option. Remeber that time value erosion (theta) is working against you and therefore share appreciation (delta) will have to overcome theta and then some to make the “wait” strategy successful. My philosophy is “if the deal is there, take it”. When we are bullish on the overall market, we can take advantage by selling out-of-the-money strikes. The more bullish we are the deeper OTM we can go as long as initial time value meets our 1-month goal. It seems to me that MACD and stochastic are not that useful because very rarely it has anything to do at the moment of selling the call, and expiration Friday. After studying many stocks through out these months, I see no connection between these tools. 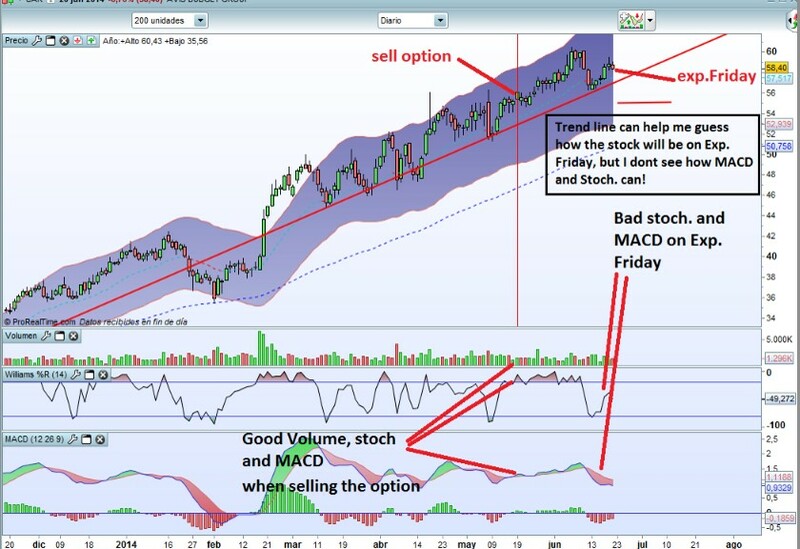 For example, a stock with great MACD, stochastic and volume when we sell the option can stay the same, be better or be worse by expiration Friday with no way for us to tell. It seems too random, so I can’t see how this helps. The one tool I’m finding very useful is trend lines, because although they don’t always work, they do in most cases. A trend line can help me guess what that stock price is going to do in the future, but I don’t see how MACD and the other tools can. Could you tell me your opinion on this, and how MACD and other indicators help you? Always great hearing from our international members. Let me premise my response by saying that what I share with our BCI members are the technical parameters that have worked best for me over the past 20 years using covered call writing as my main stock investing strategy. There are many other excellent parameters that can also be utilized. I do strongly believe that both trend-identifying and momentum-identifying parameters should be used for our 1-month obligations and these should be confirmed with volume. Trend lines are excellent, no problem here. But these are lagging indicators that can be used for support and resistance but are not necessarily predictive of future price movement and definitely need to be used with other technical indicators. Here’s where momentum indicators come into play. An uptrending stock with positive upward momentum has a better chance of success than an uptrend with declining momentum indicators. Each one on its own is not powerful enough to justify a technical conclusion but when used in conjunction with one another will paint a mosaic that will give us the best chance of success. In my view, trend is very important but confirmation with momentum idicators and volume is equally as critical as we determine our investment decisions. I now understand why they are so important. It makes perfect sense that an uptrending stock with positive upward momentum has a better chance of success than an uptrend with declining momentum indicators. I’m a recent retiree and a follower of the low risk dividend aristocrats philosophy as recommended by your fellow SA authors David Fish, Chuck Carnevale, David Van Knapp and many others. I’ve just started using covered options in my IRA relying in large part on your training materials for guidance. As a recent paying subscriber to your Blue Collar services, I was surprised to see that none of your candidates for options are large cap, high yield dividend aristocrats as recommended by SA author Richard Berger. As all of you are proponents of conservative and low risk investing, can you help me reconcile using your techniques and recommended candidates when I’m targeting dividend aristocrats as my pool of potential option candidates? Thanks for the education materials to learn the ropes of lower risk option trading. There is nothing wrong with low-risk, dividend-generating stock for our portfolios. The question is should we be making these the top criteria for a covered call writing portfolio. The cash generated from selling covered calls, to a great extent, is based on the implied volatility of the underlying securities. Many of these low-risk, dividend stocks have little IV and generate very little time premium when selling options. This is not necessarily inappropriate for ultra-conservative investors where the strategy should be re-named “portfolio overwriting” an offshoot of cc writing. The dividend aspect can be tricky too because there is a greater chance of early exercise if the time value of the option premium is less than the dividend about to be distributed prior to the ex-date. This is an issue you will have to deal with if this is the approach you decide to take. I have worked with a myriad of screens over the past 2 decades as it relates to cc writing and what I present in my material and inherent in our BCI Premium reports is what has worked best form me over a significant time frame. We also produce an ETF Report for our members where underlying securities can be much more conservative in nature. It is important to focus like a laser on the strategy you are using…is it dividend capture or is it cc writing? Perhaps a compromise could be dividing your portfolio in half and using each half for each strategy. This way you can make the best investment decisions for each. Mark, Alan’s answer is of course excellent. I will add a couple of more points. Alan’s strategy is to get 2-4%/mo returns. You won’t get that with large cap dividend paying stocks. However, if part of your portfolio strategy is to own these stocks, you can sell OTM calls on them, either monthly or as leaps. You’ll increase your “cash/dividend” return from 3ish% to 5ish% per year. This is a huge increase so very worthwhile. As an FYI, I wrote an article in Seeking Alpha about it. Just search my name. Good luck. In order to clarify your strategy for stock selection, have I got it correct in stating that you select good fundamental stocks that have good technical but also they have higher vega than bluechip stocks? It follows that these stocks would be Mid Cap, and with higher Implied Volatility so that they would generate reasonable premium on the calls? Based on that, would I be correct in saying that stocks like aapl, google and Priceline would not be suitable candidate? The confusion arises when you are using IBD as one of the tool for stock selection as they screen for good fundamentals without any regards to IV or vega. How do you account for this? Your question involves the first two. Stock selection is determined by fundamental and technical analysis as well as common sense principles such as minimum trading volume etc. So we are screening for stocks that generally would be supported by institutional traders and have positive price momentum. Option selection is based on overall market assessment personal risk tolerance (here’s where vega fits in) and chart technicals. To keep our methodology organized and to give ourselves the best chance for the greatest success, we first establish a watch list based on the stock selection criteria. This is the list from which we will select our portfolio securities for the month. 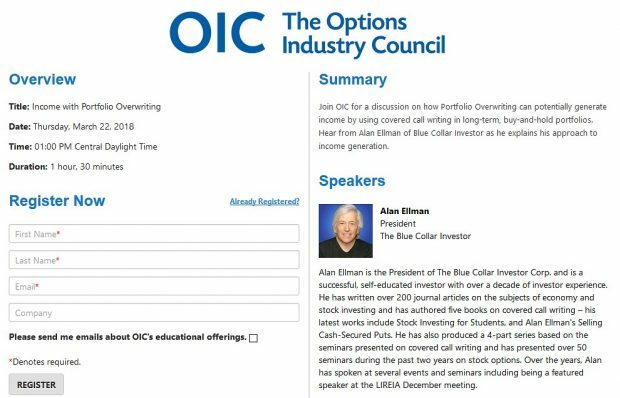 We then go to an options chain and enter the stats into the Ellman Calculator to see which options meet your monthly goal. Mine is 2-4% for initial returns in my accounts and 1-2% (with ETFs) in my mother’s account. The stocks and ETFs appropriate for your account can only be determined by you just as mine can only be decided by me. Implied volatility changes and so we, at BCI, do not make any broad decisions regarding inclusion or elimination from our Premium Stock List based on vega…that’s up to our members. For example, I will rarely accept a 1-month initial return > 7% for an at-the-money strike because the risk is too great for me. It may be perfect for others. 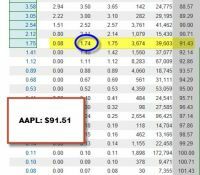 As far as a stock like Apple…it should be considered if it meets the system criteria and your return goal. In the screenshot below which I just created as I write this response, a 3 1/2 week initial return for the near-the-money strike generates 1.8%…appropriate for many but not all. CLICK ON IMAGE TO ENLARGE & USE THE BACK ARROW TO RETURN TO THIS BLOG. Our programmer has figured out the issues with the premium site and you can now login. All reports on the site are up-to-date. The good news is that my hair was white to begin with so my appearance has remained unchaged throughout the ordeal. Thanks for your patience and understanding these past few days. I too am a Seeking Alpha reader and know the Dividend Growth guys are a cult of their own 🙂 If you ever want to get punished on a comment board post a note on SA suggesting there are other ways to invest and view the world :). The beauty of Alan’s method is it’s flexibility. I own a few of the Dividend Aristocrats the Messiah’s like David Fish write about and I sell calls against them in the months they do not pay dividends because they are not earnings sensitive. The premiums are paltry but they enhance the yield. I also buy stocks off Alan’s lists because I know they are trending. Usually I let them run a bit before selling calls. And then I only sell calls on half of my position so as not to be left standing at the bus stop. I also sell cash covered puts on things I like. Income is income. I have bought several of your books and find them very informative and useful. What I haven’t found is a way to use a “Stop Loss” for stocks that have active “covered call” positions. It’s easy to understand why because an activated “Stop Loss” would require of the selling of the “Underlying” stock and leave you in a “Naked Call” position. I am not comfortable in not using a stop loss of a least 8% below the purchase price of the stop. What is your recommended solution to this problem? In the exit strategy sections of my books and DVDs, I discuss the 20%/10% guidelines. This will guide us as to when to buy back the short call and avoid the risky naked options positions you alluded to in your question. You can set this up as a “limit order” immediately after entering your initial positions. For example, let’s say you sell an option for $2. Set up a limit order to buy it back for $0.40 or less in the first half of the contract and change to $0.20 in the second half. Ask your brokerage for email notification if the buy-back is executed if you cannot check daily. Then decide if you are going to sell the stock, write another call or wait for share bounce-back. I have been going over your past blogs a few every day. Great supplement to your books. They really clarify and fill in all the little Q’s that arise throughout trading your system. I have a question that is unnecessary to know for your system but just for curiousity’s sake is there free source to find an options history chart like you have posted above? Your books and blogs are amazing! My mind is just so stimulated learning all this information. I have been trading naked calls and puts for the past 3 years with a few covered calls thrown in. I haven’t been so consistent in positive returns as I have with your system. Covered calls seems to fit my temperament the best and is now my main strategy for building wealth. This system is the real deal! Thank you for taking the time getting back to me. I noticed your Facebook post. That’s cool to see. One thing I want to clarify is that I said I traded “naked calls and puts” what I meant was I have been on the buy side of calls and puts for 3 years. Many of our members, like you, started on the buy side and ended up on the sell side.